AccuAir, Inc. 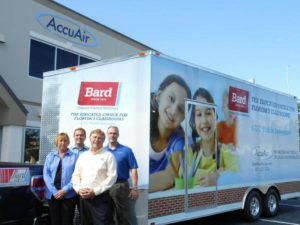 Provides Life-Cycle Service to Bard Customers | AccuAir Inc.
AccuAir Inc., Bard Engineered HVAC Product Specialists and Distributors, is proud to provide Life-Cycle Service support to their customers. Life-Cycle Service means that AccuAir support is available for any stage of a project, from product education, conceptual design, unit selection, installation, construction coordination, operations, maintenance and even unit replacement. Life Cycle Service is only one part of what makes AccuAir such an eff ective and valuable partner for mechanical engineers, consultants, educational facilities, maintenance directors, government and public facilities, architects and design-build contractors. Another part is the people. With over 12 years’ experience as an engineered products manager, Frank is well known and respected in the design-build arena. He is joined in outside sales and support by Penny Anderson and Luis Rinzivillo. They are all active members of ASHRAE. Luis, a mechanical engineer, has held sales engineering positions with Flow Control Technology, Carrier Corporation, Schneider Electric and Siemens Building Technologies. Luis brings years of HVAC industry experience to AccuAir and strong familiarity with the South Florida Market. AccuAir’s staff also includes inside sales support personnel, fi eld service technicians and warehouse and administrative employees. The combination of equipment and inventory makes up the fi nal component of AccuAir’s value offering. Recognized as a leader in the HVAC industry, Bard Manufacturing combines quality products with innovation and technological advances to deliver highperformance heating and cooling products to the commercial and institutional markets that AccuAir serves. “We pride ourselves on having products on hand when it’s needed, whether it’s a large scale school project or a single replacement,” Frank said. AccuAir Inc. inventories several hundred units along with a large selection of parts and accessories at its 26,500 square feet headquarters located at 2900 W. Orange Avenue, Apopka, FL. In addition to warehouse space and offices, the building features training and conference rooms. The Bard Touring Mobile Showroom, a specially-outfitted product trailer designed to effectively approximate the environment of a classroom or office, is based at this location. 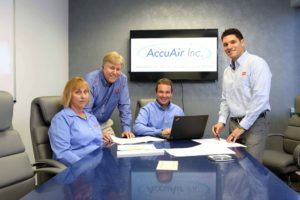 For more information about AccuAir, call 877.322.2824, email info@accuaironline.com or visit their website at www.accuaironline.com.